Be the first to share your favorite memory, photo or story of Bettie. This memorial page is dedicated for family, friends and future generations to celebrate the life of their loved one. 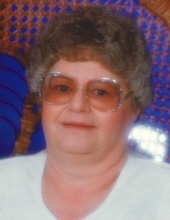 Bettie Jo Taylor, a Tonkawa resident for 43 years, passed away early Wednesday morning, October 25, 2017 at the Willow Haven Nursing Home in Tonkawa. She was 82 years old. A lunch for Bettie's family and friends will be held from 12:00 p.m. to 2:00 p.m. at the church before her service. A memorial ceremony for Bettie will be held at 2:00 pm Saturday, October 28, 2017 at our local Assembly of God Church, 206 N. 2nd St., Tonkawa, Oklahoma. All who knew and loved Bettie are welcome to attend. Bettie was born on November 29, 1934 in Charleston, WV to parents, John and Hettie Simmons. She grew up in Charleston graduating from Stonewall School High and she continued her education at Northern Oklahoma College to become a Registered Nurse. She dedicated her life to serving her community for nearly 40 years. Bettie retired from the Ponca City Hospital in December 2009 after working there for nearly two decades. Bettie married Joseph Rex Taylor on February 9, 1960. They started out living in Walton's Mountain, WV and moved to Cincinnati, OH and Billings, OK before settling in Tonkawa, OK on April 12, 1974. Bettie is survived by her son, Kenny Taylor Sr. of Tonkawa, Jerry and Leonard Holly of Bixby, OK., Dennis Holly of Brooksville, OK, and her brother John Henry Simmons of Charleston, WV; grandchildren, Rex Leroy Taylor, Kenny Bradley Taylor Jr, and David Daniel Taylor., and great grandchildren Alicia, Cherish, and David; and Rex III, Jacob, and Luke. She was preceded in death by her parents, her husband Rex, and her sister, Ellen Francis Dickens. Bettie is being cared for by Trout Funeral Home and Cremation Service of Tonkawa. To send flowers or a remembrance gift to the family of Bettie Jo Taylor, please visit our Tribute Store. "Email Address" would like to share the life celebration of Bettie Jo Taylor. Click on the "link" to go to share a favorite memory or leave a condolence message for the family.